Treat a loved one, friend or co-worker to an unforgettable dining experience with world class cuisine from Lindey’s Restaurant. Lindey’s has been voted one of Columbus’ “Top Ten” restaurants 19 years in a row, and has been featured in the Washington Post, USA Today, the New York Times and Gourmet Magazine. All orders placed via the internet before 1pm (EST) will be shipped the following business day. No deliveries or orders will be processed on Saturday or Sunday. If you place an order on Friday, it will not be shipped until Monday. Please call (614) 228-4343 or e-mail us. 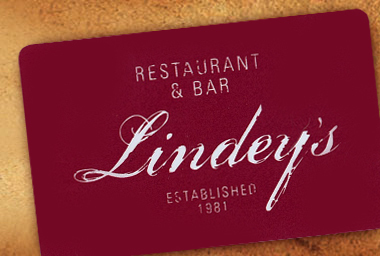 NOTE: There are no service fees or expiration dates associated with Lindey’s Restaurant Gift Cards.